This three-day route will allow you to visit one of the most unusual landscapes in the Baltic States - the Courlandian dunes. You will also visit interesting territories here in Latvia - the Pape Nature Park and the Liepāja Naval Port. The port is worth visiting while it still retains some of its Soviet-era "charm". New and unprecedented impressions will also be assured by two unique manmade objects - the "Town of Rock" and the "Town of the Absurd", which are both unique not only at the Baltic level, but in a far more extensive sense. Points of interest en route: The St Trinity Orthodox Cathedral, Rose Square, Zivju Street, the Tsar Peter the Great hut, and the Liepāja Naval Port. At the Pape Nature Park - the Pape Nature House, the bird-watching tower, and the herd of wild horses. Cycling through the Liepāja Naval Port (Karosta). The route starts and ends at the Kalpaks bridge - the length of the route is up to 10 km. The Naval Port is one of Latvia’s most unusual aspects of Soviet and industrial heritage. Worth your attention are the Kalpaks bridge (the only one of its kind in Latvia), the Naval Officers’ House, the Northern Pier, Battery No. 3 on the shore of the Baltic Sea, the St Nicholas Orthodox Cathedral (the largest of its kind), and the port itself, which presents a contrast between the Soviet era and the earlier historical period. The territory of the Naval Port is well marked with directions to the most popular tourist facilities, but the bicycle route is not marked out. Our map offers just one possible option. Overnight in a guest house in the area of Liepāja. Travel by car: Liepāja - Palanga - Klaipėda - Couronian Dunes (to Nida) - Klaipėda. Points of interest en route: The Klaipėda old city; in the Courlandian Dunes - the Maritime Museum, Witch Hill at Jodkrante, a colony of herons, a nature trail, the villages of Preila and Pervalka; in Nida - the Pārnida Dune, the Mann House, the Nida shoreline promenade. Ferry: Klaipėda - Couronian Dunes (Smiltyne). Cycling from Nida to Pervalka (~15 km) or to Preila (~10 km). This route passes along a special route for hikers and bicyclists, and it leads along a shoreline of sand dunes that have been washed onto the shore over the eons. The dunes have been halted now, but a few centuries ago they regularly covered ancient Courlandian villages. Along the way you will find two modern Courlandian villages - Preila and Pervalka. You can visit one of the shoreline pubs and taste freshly caught and smoked fish. You can return along the highway, but be very careful - it is a narrow and much-travelled road. By no means allow children to ride bicycles down this road! You can also organise transport to greet you at Pervalka. That may be the best option. Ferry: Couronian Dunes (Smiltyne) - Klaipėda. Overnight in a guest house in Klaipėda. 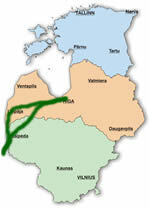 Travel by car: Klaipėda - Palanga - Kretinga - Salantai - Mosedis - Mazeikiai - Saldus - Riga. Points of interest en route: In Palanga - the Amber Museum, the Palanga Botanical Park, the Sea Bridge, the Palanga beach and Vitauta gatve, which is the main thoroughfare in town; in Kretinga - the Winter Garden of the Earl Tischkevich, the "Town of the Absurd" near Salantai, the "Town of Rock" and the Museum of Unique Stones at Mosēda. Return to Riga in the evening.